Leading Wholesaler of frp sheet, polycarbonate corrugated sheet, embossed polycarbonate sheet, uv polycarbonate sheet, translucent polycarbonate sheet and polycarbonate sheet from Ghaziabad. We are offering UV Polycarbonate Sheet to our clients. 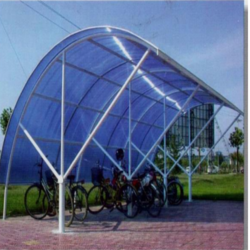 Leveraging on our years of experience and knowledge of this domain; we have been able to offer superior grade UV Polycarbonate Sheet. 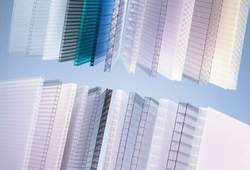 Economical & maintenance free: These polycarbonate profile sheets provides direct natural light into a building, with clear polycarbonate providing up to 80% light transmission, thus saving electricity. To allow solar control tinted sheet options are available. UV Protection: Our Polycarbonate sheet has proprietary UV protected surfaces, giving excellent durability to outdoor weathering. This superior UV resistance and toughness of Our Polycarbonate sheet is well proven by its performance since so many years. Fire Performance: Our Polycarboante Sheet has a good fire performance against many national fire codes dependant on thickness and colour. It exhibits excellent fire performance and in the event of a fire it will soften and open, allowing smoke, heat and gases produced by the fire to escape. This' venting' property means that damage within buildings can be limited. High Impact Strength: It has exceptional impact resistant properties making it suitable for use in areas with a high risk of glazing breakage, such as areas prone to heavy storms. The shatter resistance of the sheet is up to 200 times stronger than glass. Thicker sheet options are available to provide greater strength where required. 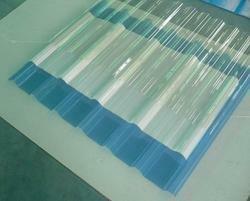 Light Transmission: Transparent Polycarbonate sheet have excellent light transmission, between 84 and 87%. However for buildings in hot climates or with south facing aspects, our Polycarbonate sheet is available in translucent bronze, grey and opal white. Our Polycarbonate sheet essential opaque to all wave lengths below 385 nanometres. This useful shielding property can prevent discolouration of sensitive materials placed under or behind the Polycarbonate sheet. Design Flexibility: Our Polycarbonate sheet can be easily cold formed into gentle curves which make it ideal for skylights, covered walkways, barrel vaults etc. Our Polycarbonate is tehermo-formable and can be thermoformed into the desired geometry whilst retaining the UV resistant coating specially developed for weather resistant applications. 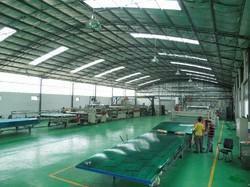 Keeping in mind the customer’s flamboyance requirements we are engaged in offering Industrial Polycarbonate Sheet. Made out of polycarbonate polymer which is durable, high impact resistant, scratch resistant, heat resistant and most importantly UV resistant. These sheets are perfect for enhancing home and outdoor living spaces. 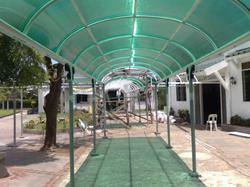 Additionally, this is able to maintain its long lasting look by resisting from yellowing that happens due to UV light. 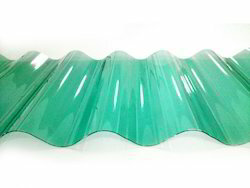 With vast attributes this particular group of sheets that is Polycarbonate Roof Sheet a thermoplastic polymer inhibits temperature resistance, impact resistance and optical properties. These can be effortlessly worked, moulded and thermoformed, finding applications in crenelated profiles, dome lights, flat or curved glazing and sound walls. Additionally, since it is transparent it allows better light transmission and is resistant to cracking, breaking and corrosion resistant. Accompanied by professionally inhibited workforce and use of industry standard components we are engaged in offering UV Polycarbonate Sheet which provides direct light into the building which save electricity. 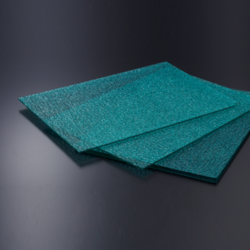 The UV resistant sheet has been proven its toughness and performance since years. Furthermore, the high impact strength ensures far lesser damage to the building and in case of fire it softens an open up ensure escape of smoke, heat and gases. Customers can opt for thermoform into desired geometry and varied range of thickness to suit their application requirements. 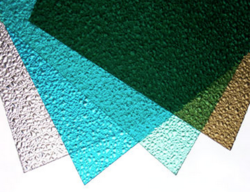 Being one of the eminent manufacturers and suppliers, we are engaged in manufacturing and supplying a wide range of FRP Sheets.